The Supreme Court in Cheviti Venkanna Yadav vs. State of Telangana and Ors, upheld the constitutional validity of sub-section (3) of Section 5 of the Andhra Pradesh (Agricultural Produce and Livestock) Markets (Amendment) Act, 2015. The Supreme Court in Harbeer Singh Vs. Sheeshpal, observed that delay in recording of statements of the prosecution witnesses under Section 161 CrPC., although those witnesses were or could be available for examination when the Investigating Officer visited the scene of occurrence or soon thereafter, would cast a doubt upon the prosecution case. The Supreme Court in Yogesh Singh Vs. Mahabeer Singh, held that the burden on the prosecution is only to establish its case beyond all reasonable doubt and not all doubts and the rule regarding the benefit of doubt does not warrant acquittal of the accused by resorting to surmises, conjectures or fanciful considerations. The Supreme Court, in State of Punjab vs. Jagjit Singh held that temporary employees would be entitled to draw wages at the minimum of the pay-scale (- at the lowest grade, in the regular pay-scale), extended to regular employees, holding the same post. The Supreme Court in Ashok Kumar vs. State of Bihar, reiterated that the candidates who failed to raise any objection to a selection process were estopped from turning around and challenging the selection once they were declared unsuccessful. The Supreme Court in Satya Pal Anand vs. State of M.P, held that once the document is registered, it is not open to any authority, under the Registration Act, 1908, to cancel the registration. Granting permission to amend grounds of review petition, the Supreme Court stayed the execution of the death sentence ‘pending further orders’ awarded to Mofil Khan and Mobarak Khan for murdering Haneef Khan and family consisting of his wife and four sons. The Supreme Court in Northern Railway vs. M/s. Pioneer Publicity Corp. Pvt. Ltd., observed that Section 34(3) of the Arbitration and Conciliation Act has no application in re-filing the petition, but only applies to the initial filing of the objections under Section 34 of the Act. SC Defers The Hanging Of Vikram Singh And Jasvir Singh, Reserves Its Judgment On Their Review Plea. The Supreme Court bench comprising justices Dipak Misra, R. Banumathi and Ashok Bhushan, on Tuesday extended the stay on the hanging of Vikram Singh and Jasvir Singh, who were sentenced to death for the kidnapping and murder of Abhi Verma, son of an established jeweler of Hoshiarpur, Punjab, in 2005. The Supreme Court dismissed cricketer-turned-politician Navjot Singh Sidhu’s plea to quash an election petition filed against him by his rival Om Prakash Soni. In a huge relief to commuters, the Supreme Court on Friday rejected the plea of Noida Toll Bridge Company Limited to stay Wednedsday’s Allahabad High Court order asking it to stop collecting toll from commuters plying on the DND flyway connecting Delhi and neigbouring Noida. In a major relief to Delhi Chief Minister Arvind Kejriwal and AAP leader Kumar Vishwas, the Supreme Court on Thursday stayed the summons issued against them by a court in Uttar Pradesh and issued notice to the state government. The seven judge constitution bench of the Supreme Court which is hearing a slew of petitions relating to decisions and questions on electoral malpractices arising out of its earlier judgments on Tuesday,said for now it will not touch on its 1995 definition of “hindutva is a way of life and not a religion” and also not ban its use during elections. The Supreme Court observed that increasingly orders passed by the Bombay High Court were not being made available to all parties involved in a particular case. 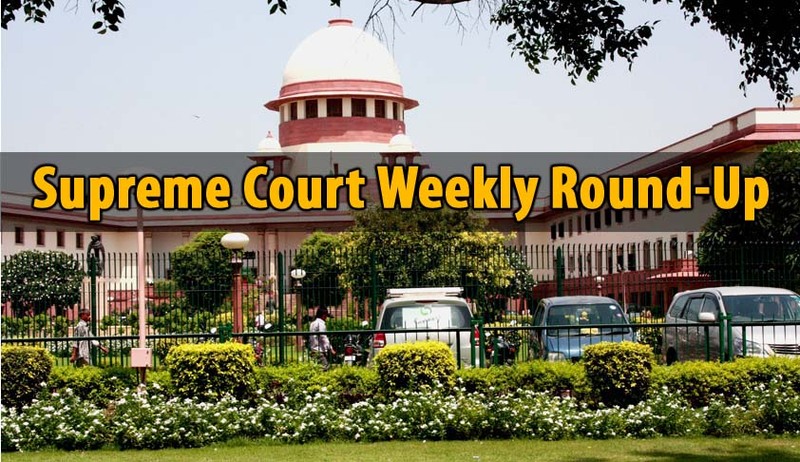 A Bench of Justice Madan B Lokur and Justice Adarsh Kumar Goel observed in an order dated October 24, 2016, that the Bombay High Court repeatedly passed orders without making copies available to all the parties in a particular case. The Supreme Court on Tuesday pulled up business tycoon Vijay Mallya for not making full disclosure of his foreign assets and gave him a last chance to do so by November 24. A bench of justiceKurien Joseph and Justice Rohinton F Nariman directed Mallya to give “all details of assets” by that date. The Supreme Court on Friday issued a notice to the Centre, in a Public Interest Litigation (PIL) seeking directions to the government to take appropriate steps to specify what would constitute disrespect and abuse of the National Anthem. The Supreme Court on Monday asked the RBI why names of 57 borrowers who have defaulted on bank loans worth a whopping Rs 85,000 crore should not be made public. The bench said if the bar was lowered below Rs 500 crore, then the default amount would cross over Rs one lakh crore. Supreme Court of India has agreed to hear a Public Interest Litigation seeking for making Yoga compulsory for all the students of Class I-VIII.